Warm a winter’s day with one of these healthy, nourishing, energising soups from our Turkish kitchen! As soon as the days get shorter and the leaves on the trees start to change colour our thoughts turn to winter and ways to keep warm on colder days. The cold seems to encourage us to slow down and take pleasure from the simpler things in life. With such an abundance of vegetables available at this time of year, this gives us the perfect opportunity to create delicious, heart warming food from locally grown produce. 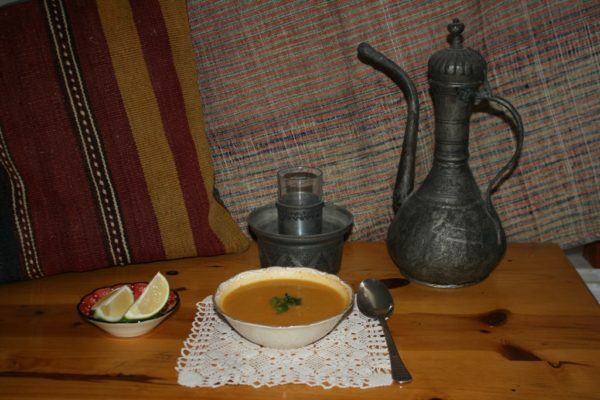 ‘Çorba‘ (pronounced chorba) the Turkish word for soup, is a food deeply ingrained in Turkey’s nomadic past. Classic Turkish soups are made with meat stock, designed to make valuable use of the entire animal. Combinations of pulses, grains and vegetables, flavoured with herbs and spices make nourishing hearty soups. ‘Tarhana’ is probably Turkey’s most symbolic soup, a mix of coarsely ground wheat and yoghurt, pounded together with spices and tomato paste and left in the hot summer sun to dry. 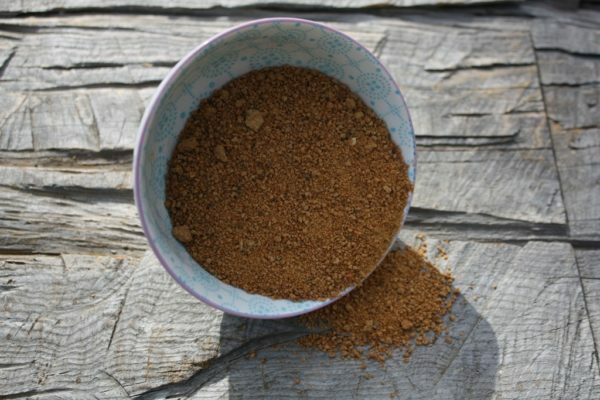 The dried mixture is then crumbled and stored indefinitely to provide an instant soup when mixed with water. Shepherds still use this as a food source in the winter months they spend with their flocks in remote mountain pastures. Soups can be the first course of a meal or be nourishing enough to be a meal in themselves. In Turkey in the colder months, soup is often eaten for breakfast. Soups are made using whatever vegetables are in season or with grains, pulses and a mixture of herbs and spices. 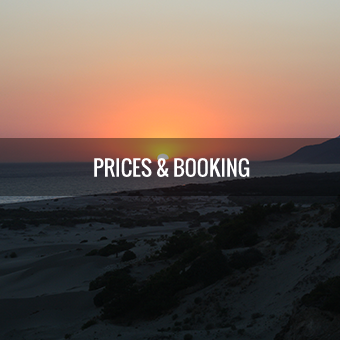 Nowadays in Patara, Autumn is the season for harvesting olives, grapes, pomegranates, apples, pears, plums, sesame and a vast array of vegetables. Much time is spent outdoors and we need to fuel ourselves on nourishing lunches that can be carried to wherever we are working. 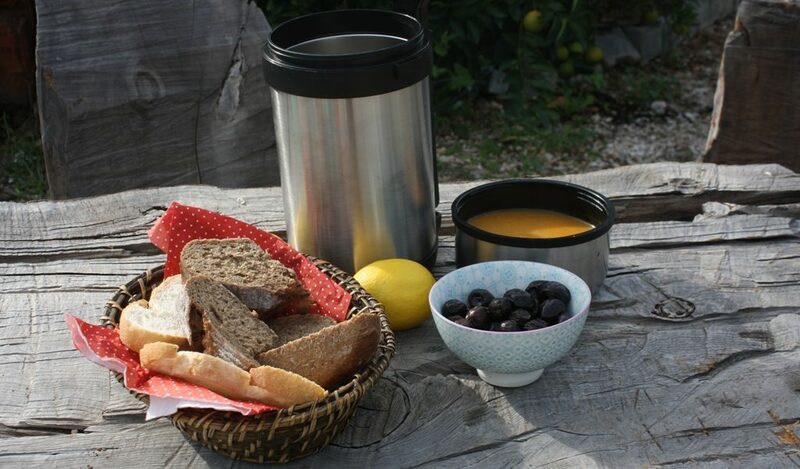 Soups are ideal as they are warming,filling, and energising and can be transported in a large thermos together with some fresh bread and a selection of fruits to be eaten afterwards. Here are three of our favourite easy to make soups. So why not wrap up warm and indulge in some time outdoors this weekend, then return home to some home made Corba!. Serve with crusty freshly baked bread and your soul will be warmed. 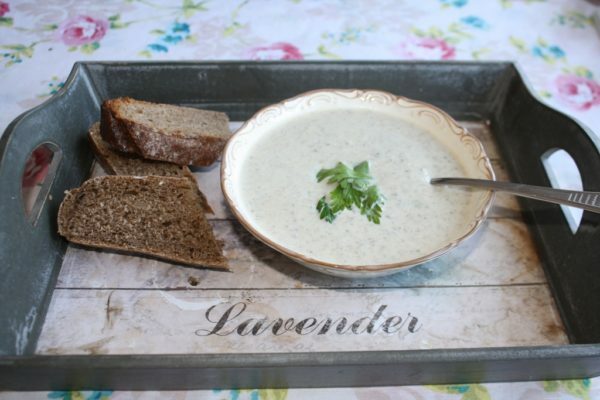 A creamy nourishing soup that will warm your soul. Allow to cool before blending until smooth. adjust seasoning to taste and add a sprig of parsley for decoration and colour. Because of their rich protein content, lentils are a valuable food source. 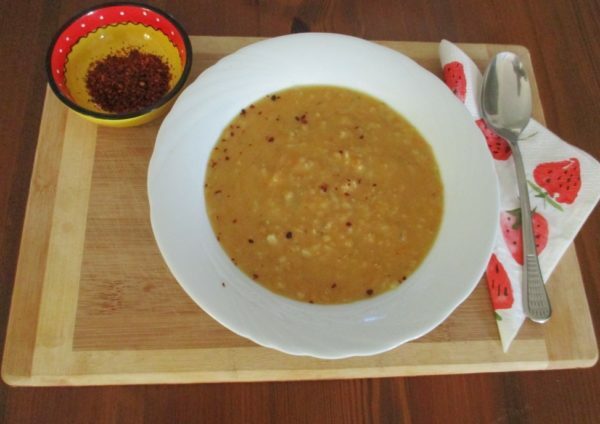 Lentil soup is probably Turkey’s most popular soup today. You may even be offered it for breakfast on a cold winter morning! Heat the oil or butter in a saucepan and saute the onion until transparent. Grate the carrot and the potato and add to the onion. Mix well and cook for 2 minutes. Add 100g red lentils. Stir well. Bring to the boil and then reduce to a simmer. Simmer for about 30 minutes until the vegetables and lentils are cooked. Add more water if you prefer a thinner soup. If you prefer a smooth soup, then blend the soup once cooled and reheat to serve. We prefer to eat this soup without blending as it is a delicious, thick, hearty soup. A meal in its own right! Serve with warm crusty bread. Add a sprinkling of paprika flakes to give a fiery taste. A squeeze of lemon juice adds extra zing. Tradition demands that the new bride must win her mother in law’s approval. Much depends on her abilities to cook. The story goes that a young bride to be, named Ezo, was requested by her future mother in law to make a soup. A flustered Ezo concocted a soup made from what she had at hand: red lentils, bulgur, rice, tomato paste, hot pepper and mint. Luckily the combination of the ingredients made a delicious hearty soup!! We presume young Ezo met her mother in law’s approval! Put the onion, lentils, stock, rice and water together in a pan. Bring to the boil and then lower heat. Simmer for about 30 minutes, stirring occasionally. Cook until the rice and lentils are tender and the soup has a creamy consistency. Serve hot with fresh crusty bread and a chunk of lemon.